When we left my dock this morning, the weather was absolutely perfect! We had warm temperatures , and light winds out of the east. 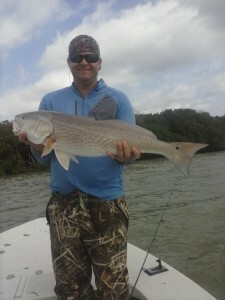 We decided to head down south and fish the Broad River area for redfish and snook . When we arrived at the first spot, the redfish where hungry and on the bite. Within minutes of casting out a fresh cut piece of lady fish, we were hooked up with a redfish that measured in at 34 inches and weighed in at 14 lbs . After catching several more nice sized redfish, the tide starting to fall. We decided to move up the river where we caught a few snook, in the 5 – 10 lb range . April is a great month for fishing in the Everglades! Don’t miss out! Give me a call, and let me get out on the water for a great day of fishing!